This tutorial is about Enable Captcha on Customer Login / Register Magento 2 .Very often many developers face trouble and ask many questions about how to Enable Customer Login / Register Captcha in Magento 2. This is a very important demand now a days and an essential one considering the security over the internet.Moving forward, this article would be the piece of writing you should definitely read. Magento 2 supports administrators to set CAPTCHA requirement for each time customers log into their accounts. The website is enabled to avoid spam and the Robots login to website. Thus, this feature will increase effectively your store security. To protect your store, you should enable Admin login Captcha and install Security module. So in the backend, you can configure whether customers are required to enter a CAPTCHA each time they log into website, or after several unsuccessful attempts to log in. On the Admin panel, click Stores. In the Settings section, select Configuration. In the Font field, select the name of the Font to be used for the CAPTCHA symbols. The default is LinLibertine. In the CAPTCHA Timeout (minutes) field, enter the number of minutes before the CAPTCHA expires. When the CAPTCHA expires, the user must reload the page to generate a new CAPTCHA. In the Number of Symbols field, enter the range number of symbols that CAPTCHA will be changed in, for example: 3-7. The maximum number of symbols is eight. 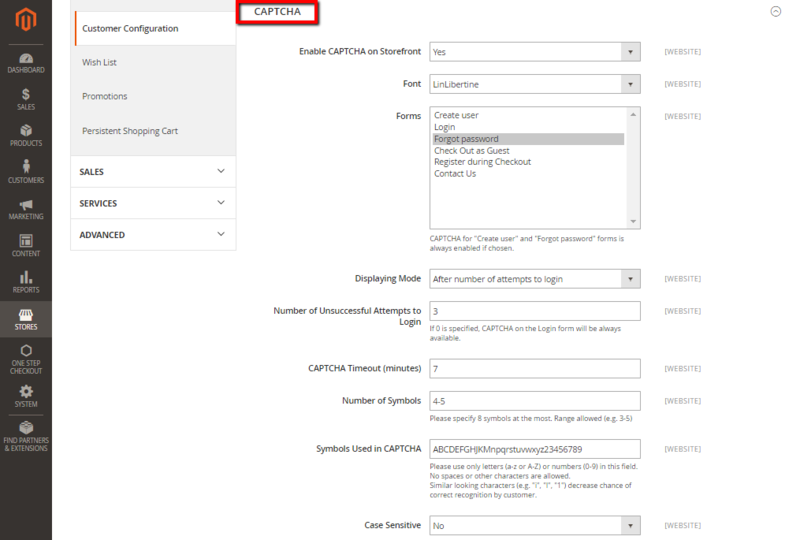 In the Symbols Used in CAPTCHA field, specify the symbols that can be used in the CAPTCHA. Set only letters (a-z and A-Z), or number (0-9) to enter into the box. No spaces or other characters are allowed and the similar symbors is not used in the default. So, that’s it from this tutorial. I strongly believe there is always room for improvement.So i am open for any suggestion and feed back. Please feel free to leave hat you are thinking in the comments section below. Cheers.